RAISE is a spatial data tool that enables users to quickly estimate and visualise property value. Property values are rapidly calculated using any one of the automated valuation models available on the toolkit. 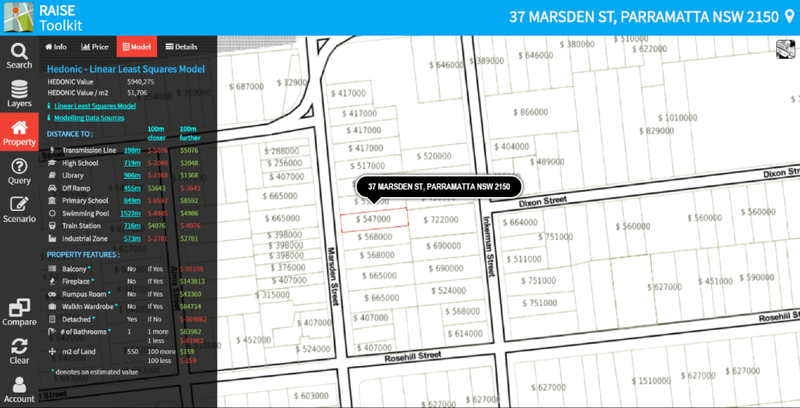 The generated values are visualised on a map and can be overlayed with other geospatial information layers relevant to investigating trends in property price. Please click here to download project factsheet. Tool showing automated valuation for a selected property based on hedonic modelling. The side panel shows a breakdown of variables that affect property price. Value uplift modelling: Users can investigate potential value from hypothetical addition of infrastructure. Interactive scenario exploration: The tool's dashboard interface will allow easy comparison between different development scenarios and their projected value uplift. Collaborative planning: Rapid and interactive visualisation of property values, potential value uplift, and other relevant data layers can facilitate communication and collaborative planning with different user groups. Development of 3D visualisation for the toolkit is currently being explored. 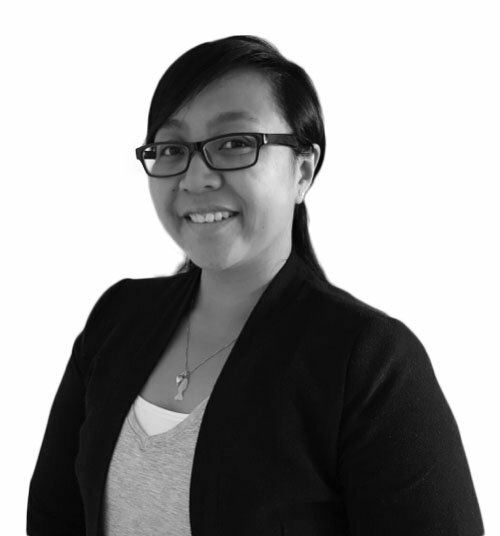 Cloud-based architecture: RAISE's back end is built on open , cloud-based architecture that enables the toolkit to link diverse property and geospatial data to models and visualisations. Governments and businesses have access to unprecedented amounts of information to guide their decisions: big, diverse and rapidly changing data. And they increasingly have to turn to spatial data tools to combine and process it all. But to harness collective intelligence and foster transparency in decision making, these tools must also enable that data to be analysed in collaborative ways. Tools like RAISE which allow interactive scenario exploration can support collaborative analysis. Interactive scenario exploration would allow users to rapidly formulate and test hypotheses and options. The spatial data tools draw together and analyse the data with automated modelling; and offer immediate visual feedback on how scenarios compare with each other. Key end users of the initial RAISE toolkit include land valuers, and city planners and their partners investigating different transport infrastructure options. The toolkit will help understand the impacts on land values, and the potential for value sharing policies to contribute funding to this infrastructure. Toolkit development and research are collaboratively undertaken by UNSW’s City Futures Research Centre and QUT’s Creative Industries Design Lab. 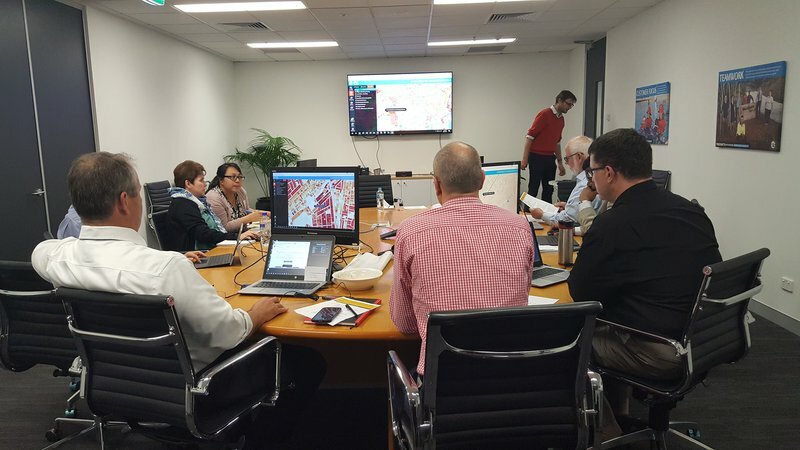 The project team is working with industry partners Australian Property Monitors and Omnilink, and government partners NSW Land & property Information and Parramatta City Council. Along with financial and in-kind contributions from the project partners, RAISE is funded by the Cooperative Research Centre for Spatial Infrastructure. Established in 2003, with a renewed funding commitment in 2010, the CRC SI is an international research and development centre, comprising over 100 partner organisations in business, government and education.